I begin writing this I'm not sure exactly what if anything I should say about it. So anyway let's just see where it goes. As I said in the original post that I sent out just an hour or so before starting, the 100 miler was something I had been planning and looking forward to all year and was really excited that the time had finally arrived. I knew Amy was planning to come and spend some time with me but I really hadn't expected her to be meeting me at the start but she is a dear friend and one of my special running Angels so I was really happy that she would be there to share in this with me. I arrived just a few minutes before 6am and she was already waiting for me. It was a beautiful morning and the forecast was for cooler than normal Boogie weather, but actually about normal for this time in June. We began precisely at 6 by my watch and slowly moved ahead with smiles on our faces and excitement about what the day would bring. After about a mile we stopped to get some pictures of the the gorgeous golden sunlight breaking through the trees. Little did we know that just over the next hill our day was about to take a horrible turn for the worse. I'll just let you read about it here. The Dog Attack. As the owner led the dog away, we began to run again , stunned, angry, confused and in pain. We didn't really know what to do at this point. Should we call the sheriff? Go to the hospital ? Well, all we could do for the moment was keep running until we finished the first 6 mile loop. The adrenaline was really flowing so after 2 very fast miles I told Amy that maybe we should slow it down a little. My left leg was not hurting too much to run but the right leg was very painful because of the location of the punctures were right in the side of the quad that absorbs most of the shock of each step. Amy was hurting too but she said it wasn't bad. We made it back to the cars and stopped to clean up a little and decide what to do next. I was really torn at this point. I knew the sensible thing to do would be to go ahead and go to see a doctor but I wanted to do this run so bad that I didn't intend to let anything stop me as long as I could handle the pain. I was concerned for Amy and although I was glad that she was there I should have insisted they she go ahead and get treated. I felt so bad that she had gotten up so early and driven this far just to run with me and now she was bleeding and in a bit of shock from the ordeal. We decided to keep going and finish the first 10 miles and see how things would go so we headed down the hill. Running down the hill was pretty bad but once I had been running for awhile it kind of went numb and was just a dull ache. We were making the best of a bad situation and tried to get back to normal with smiles and joking around like we usually do and soon we were back at the church, only about 6 or 7 minutes behind the pace I had planned for the first lap. Not too bad considering the attack and stopping to clean up. I decided not to even bother with trying to clean the wounds anymore. I knew I was just going to bleed anyway so I just ate some food. grabbed another couple of gels and refilled my bottle. Amy was still wanting to continue so we started out on the 2nd loop. We were very cautious as we approached the dogs house again. Amy had her pepper spray but we really didn't want another encounter. We were very pleased to see the dog was in his pen and no sign of the other dogs. As we were running down Cartledge Creek Rd, a truck pulled up and it was Lee Watson. He asked if I was Joey because he had seen my post on FB. He wished us luck and then went on about his business but later he said he wasn't aware of the attack at that time. After we passed the dog pen and headed down Holly Grove Church Road , Amy got a call from Jenn checking up on us. She had seen the post from Amy about the dog attack and was worried about us. Another one of my dear Angels. She was encouraging us to get the wounds taken care of but I told her in my best Jessie The Bod Ventura voice from Predator that "I ain't got time to bleed"
Amy assured her that I was doing a great job of drinking and eating since I apparently was not going to stop running. And I was. I made sure I drank a full bottle between trips to the car plus drink more at each stop and was eating and taking gels regularly. Other than the pain from the bites I was feeling great. The next 10 miles were pretty uneventful. I was running well and it was still a beautiful day. As we were nearing the marathon point it was getting very warm and by now there had been no shade on the course for a couple of hours. I had plenty of sunscreen and I had prepared for hotter weather so it was not a problem but I knew I had a long day ahead of me and I had to be sure and keep my head in the game. As we approached the church at mile 26 we saw Bobby Cordell had arrived early. He was concerned after seeing the dog bites. By now I had bleed through both layers of my shorts and they were caked in blood. Amy left after running the 26.2 and now I had about 6 hours ahead of me before the others in the real race would be joining me for the evening. I headed down the hill once again trying to maintain a good attitude and block out the pain as well as I could. About halfway up Bethel Church Hill I saw Bobby driving towards me. He was worried about me being out there in the sun and bleeding but I assured him I was doing fine at the moment. As I completed the first 30 miles I was pretty happy with how things were going. My feet were in great shape and feeling no ill effects from pounding the pavement. Usually by this time at the Boogie my feet are hurting but I had been making a special effort to land as lightly as possible on my feet and it seemed to be helping. I went to the porta pottie and wouldn't you know it. I got my hand stuck in the door and when I pulled it out I cut my left hand and it was bleeding worse than the dog bite. I sat down to eat a turkey sandwich for lunch and Bobby saw my hand and thought it was from the dog but I told him it was just some random injury from a porta toilet of all things. I'm a little foggy on the details but around this time Frank Lilley and Paul Heckart arrived on the scene and it was great to have them around to give me support and encouragement each time I came back by the church. I had taken about a 15 minute break so it was time to go if I was going to stay on schedule. It took awhile to get the legs moving again and the bites were hurting quite a bit but fortunately after I warmed up again the pain eased off again. It was getting hot now and the sun was beating down so I was taking it very easy and making sure I didn't get over heated. I seemed to be handling the heat very well and I was really glad I had stashed a cooler at the dog pen so I could refill every 3 or 4 miles during the day. 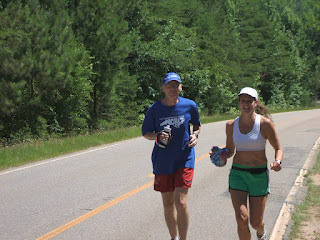 Just as I was coming back up at mile 36, Jeff Kimrey drove by and told me it was now 84F. Not too bad but with no shade it was still a bit uncomfortable and I had to be careful. I got the 4 mile out and back done and now just one more lap before the real race would begin. As I headed down the hill to start lap 5 I saw Doug arriving in his truck and he stopped to set out a trash can at the bottom of the hill. I showed him the bites and he said he was real sorry it happened but I told him there was nothing he could do and it would be alright. I was still feeling pretty good and confident I could keep going. I was still feeling ok other than the pain but I was a little slower at 40 than I had hoped so I had to push the pace just a little bit more than I wanted to from 46 to 50 so I would have at least 15 minutes to get ready for the start of the 50 mile race. I made it back in 11:45 and headed straight for my chair to rest and eat before the start. Jeff went to get my number for me and Jenn and Lisa were there and took care of making me another turkey sandwich and re-filling my bottles while I made my preparations. I waited until the last minute to make my way to the line and then I waited until everyone had started before I headed out after them in last place. I was still moving at a decent pace and not feeling bad for a guy that had just run 50 miles. I was happy to see some shade had returned to the course and was looking forward to the cooler night time temperatures. I made the first 6 mile loop doing well and it was great to see the volunteers and the other runners out on the course. I was quickly out and headed down the big hill and enjoyed seeing my friends that were ahead and coming back up encouraging me along. As I made it back up the hill to complete mile 60, I was a little disappointed in my lap time but I was in no hurry and figured I should be able to maintain about that same pace and amount of running each lap. I went back by my car to get some coke and finish my sandwich before heading back out again. As I made my way over to the aid station before beginning the next lap I noticed my legs were not too steady but I thought once I got back to running again they would be fine like they had been all day. Fred gave me some marshmallows and I ate them as I walked down the hill. Once they were in my belly I started to run. Or I tried to. The legs were not cooperating. Hmm, this is not good. I decided to walk until I got to the top of the first hill and then get going but halfway up the hill I was beginning to stagger a little. I'll be ok I was thinking. Once you get to the top you can run downhill and everything will be fine. I did and then begin walking up the next hill but my legs just begin to crumble beneath me. As I staggered up the hill I was really getting worried. I knew I had been drinking and eating plenty so something else was going on. Was I going into shock? I didn't know. All I knew was I was in trouble. I stopped and tried to decide what to do. I wanted to finish this run so badly. Maybe I could make it to the next aid station and take a break and everything would be alright. That's how it usually works when I hit a bad spell in an ultra. I stumbled on for another 100 yards and then just stopped. I knew I would never make it to the dog pen and I was not going to collapse in the road and have someone have to send help. That was one thing I couldn't do. I knew when I mentioned this to Doug in January that he trusted me to know how to take care of myself and I did not want to be a liability for him or this race that I love. So I turned around and begin walking back to the church. And then the tears came. I was so frustrated angry and I was just so tired of hurting and bleeding and there was not a thing in the world I could do to change any of it right now. I was thinking about Amy and worried about her too. It took me about 30 minutes to slowly stagger back to the church where I was surrounded by many caring friends that helped me into a chair and propped my feet up for me. So many. Vickie Fogelman, Marie Lewis , Doug, Tom Herbst, Ben Dillon , Fred Dummar , Charles West and probably some others but my mind was not the clearest . Thanks to all of you. Someone brought me some ice bags for the bites which were swollen very badly by now. After a few minutes the pain was so intense that I had to get up but I could barely walk. Tom helped me and asked me where I wanted to go . They wanted me to go inside and eat but I had to go lay down so we made it over to the church steps and I stretched out there. That felt much better and Charles kept a check on me and Ben brought me some teryaki chicken. Lisa had dropped out of the marathon so I was going to wait for her to drive me back to Wake County and to the hospital in Cary. While I was waiting a pretty young angel came over and said, Hi I'm Kelly. I'm an ER nurse at Richmond County Medical center and I would really like to take you to the hospital. I told her I needed to talk to Lisa first since she was driving me. Lisa was fine with the plan so I rode with Kelly to Rockingham and Lisa followed behind. Lisa of course is one of my Angels and what a great friend. I was in the hospital for 4 hours and she had to wait patiently in the waiting room bored and tired until 3am and then drive me back to Cary. So that's how it ended. 62 miles and a trip to the hospital for cleaning, and IV antibiotics and fluids. They of course thought I was crazy when they found out I had run 60.5 miles after the attack. Not exactly how I had envisioned this when I started. So now that it's done I still have a lot of mixed emotions and thoughts about it. Yes, I am glad in a way I ran the 62 but I also realize it was really dumb. And I really feel bad about how it turned out for Amy. If it wasn't for her being such a great friend she would not have been there to get bitten. I know she wanted to be there but I hated to see her get bitten. I am disappointed in myself for not being more cautious when we saw the dog and I really didn't assess the situation properly. I've had dozens of dog encounters over the years but sure mis-read this one. Well, nothing I can do to change it now so it's time to move on. The wounds are healing nicely 3.5 weeks later. Just some swelling and a little tenderness now. here is the link to some pictures. Glad to hear you're recovering well. Very sorry to read about the bite - as a dog owner I think it's ridiculous that people can't keep their animals under control. I've been chased by a Rottweiler near my house but was lucky enough to be past the property when he noticed me and he thought I wasn't worth the trouble. Sure got my heart pumping though. On the other hand, what a badass for running 62 miles after the bite. Well done. One thing is for sure . . . you'll NEVER forget this run! Probably the most memorable run you've done - and you've done plenty! You definitely qualify for the 'tough guy" award this year!! I am glad you took the time to write it up. I know it had to be tough to do. It was a difficult day as well as the following days and weeks with recovery. I read your blog and see you are concerned for me, you read mine and see that I was concerned for you. I still think that despite it all, 100K with the injuries you had was an amazing accomplishment. I was happy to run with you and glad that you did not have to go through it alone.